The first Kerry Taylor auction of 2018 was a huge success. This bumper sale included over 500 lots of vintage fashion, antique costume and textiles, with strong bidding take place online from around the world and in their saleroom in London. 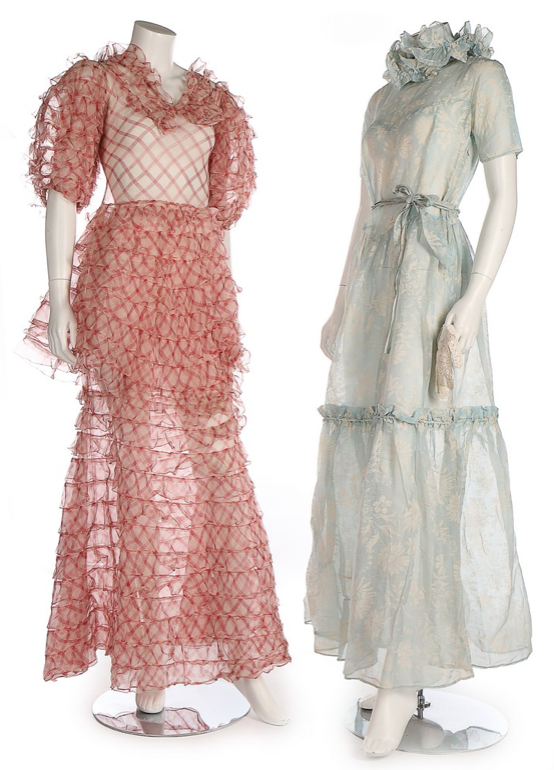 Both major private collections featured in the auction proved extremely popular: The Stephen Furniss collection attracted lovers of 1930’s-40s fashion, with these two 30s garden party gowns (together with two others in the lot) selling for a surprising £1,800, well above their estimate of £150-250 (Lot 274, see below). A rare studded crepe ensemble by Chicago based manufacture Fred A. Block was fought over, selling for £650 (Lot 282, below). This wonderful example of mid 1940s fashion was previously exhibited at The Imperial War Museum, London. 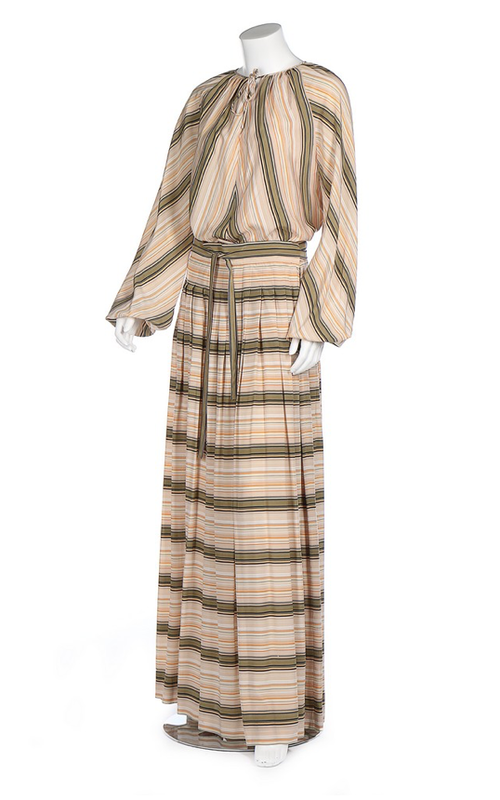 The collection of the late Anne Greaves included a fascinating array of clothing from wardrobes of celebrities including Lauren Bacall, Joan Crawford and Liza Minnelli, with a striped 1970s Gucci ensemble belonging to Jackie Onassis selling for £1, 400 (Lot 160, below). A surprise star lot in the sale was this charming sampler dated 1678 by Martha Mellis, which was in exceptionally good condition and sold for £4,800, far surpassing its estimate of £600-1000 (Lot 508). Alexander McQueen proved popular in the saleroom, with both wearable ensembles and catwalk pieces selling strongly. The 'Widows of Culloden' Autumn-Winter 2006 collection chiffon dress, estimated at £400-600 sold for £1,800 (Lot 241, see below), and a group of tailored ensembles, dating in the 2000s, sold for £1,500 (Lot 244). They are now taking entries of vintage couture and fine antique costume for their upcoming ‘Passion for Fashion’ auction on the 18th June. This sale already includes some of the best examples of vintage couture in the world, and will feature the second chapter of the Anne Greaves collection, with items from the wardrobes of fashion icons such as Audrey Hepburn and Dior haute couture worn by Olivia de Havilland. If you have items you wish to consign, please contact them directly. The deadline for entries is the end of April.